B-java: We make our own goodies! We make our own goodies! See me next week! Goes great with coffee! What to do with a cookie and ice cream? 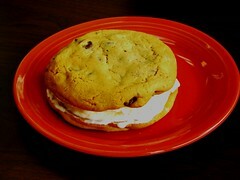 Come in and check out our new cookie ice cream sammies!